Taqī ad-Dīn Ahmad ibn Taymiyyah (Arabic: تقي الدين أحمد ابن تيمية, January 22, 1263 - September 26, 1328), known as Ibn Taymiyyah for short, was a controversial medieval Sunni Muslim theologian, jurisconsult, logician, and reformer. A member of the Hanbali school of jurisprudence founded by Ahmad ibn Hanbal, A polarizing figure in his own lifetime, Ibn Taymiyyah's iconoclastic views on widely accepted Sunni doctrines such as the veneration of saints and the visitation to their tomb-shrines made him unpopular with the majority of the orthodox religious scholars of the time, under whose orders he was imprisoned several times. A minority figure in his own times and in the centuries that followed, Ibn Taymiyyah has become one of the most influential medieval writers in contemporary Islam, where his particular interpretations of the Qur'an and the Sunnah and his rejection of some aspects of classical Islamic tradition are believed to have had considerable influence on contemporary Wahhabism, Salafism, and Jihadism. Indeed, particular aspects of his teachings had a profound influence on Muhammad ibn Abd al-Wahhab, the founder of the Hanbali reform movement practiced in Saudi Arabia known as Wahhabism, and on other later Wahabi scholars. Moreover, Ibn Taymiyyah's controversial fatwa allowing jihad against other Muslims is referenced by al-Qaeda and other jihadi groups. Ibn Taymiyyah's full name is Taqī ad-Dīn Abu 'l-`Abbās Ahmad ibn `Abd al-Ḥalīm ibn `Abd as-Salām ibn ʿAbd Allāh ibn al-Khidr ibn Muhammad ibn al-Khidr ibn `Ali ibn ʿAbd Allāh ibn Taymiyyah al-Ḥarrānī (Arabic: تقي الدين أبو العباس أحمد بن عبد الحليم بن عبد السلام بن عبد الله بن الخضر بن محمد بن الخضر بن على بن عبد الله ابن تيمية الحراني‎). Ibn Taymiyyah's name is unusual in that it is derived from a female member of his family as opposed to a male member, which was the normal custom at the time and still is now. Taymiyyah was a woman, famous for her scholarship and piety and the name Ibn Taymiyyah was taken up by many of her male descendants. Ibn Taymiyyah had a simple life, most of which he dedicated to learning, writing, and teaching. He never married nor did he have a female companion, throughout his years. Al-Matroudi says that this may be why he was able to engage fully with the political affairs of his time without holding any official position such as that of a judge. An offer of an official position was made to him but he never accepted. His life was that of a religious scholar and a political activist. In his efforts he was persecuted and imprisoned on six different occasions with the total time spent inside prison coming to over six years. Other sources say that he spent over twelve years in prison. His detentions were due to certain elements of his creed and his views on some jurisprudential issues. However according to Yahya Michot, "the real reasons were more trivial". Michot gives five reasons as to why Ibn Taymiyyah was imprisoned, they being: not complying with the "doctrines and practices prevalent among powerful religious and Sufi establishments, an overly outspoken personality, the jealousy of his peers, the risk to public order due to this popular appeal and political intrigues." Baber Johansen, a professor at the Harvard divinity school says that the reasons for Ibn Taymiyyah's incarcerations were, "as a result of his conflicts with Muslim mystics, jurists, and theologians, who were able to persuade the political authorities of the necessity to limit Ibn Taymiyyah's range of action through political censorship and incarceration." Ibn Taymiyyah's own relationship, as a religious scholar, with the ruling apparatus, who did deviate in application of shari'a law, was not always amicable. It ranged from silence to open rebellion. On occasions when he shared the same views and aims as the ruling authorities, his contributions were welcomed but when Ibn Taymiyyah went against the status quo, he was seen as "uncooperative" and on occasions spent much time in prison. Ibn Taymiyyah's attitude towards his own rulers, was based on the actions of the companions (sahaba) when they made an oath of allegiance to Muhammad as follows; "to obey within obedience to God, even if the one giving the order is unjust; to abstain from disputing the authority of those who exert it; and to speak out the truth, or take up its cause without fear in respect of God, of blame from anyone." His father had the Hanbali chair in Harran and later at the Great mosque of Damascus (Umayyad Mosque). Harran was a city part of the Sultanate of Rum, now Harran is a small city on the border of Syria and Turkey, currently in Şanlıurfa province, a place to which Moses was reportedly sent to provide guidance. Before its destruction by the Mongols, Harran was also well known since the early days of Islam for its Hanbali school and tradition, to which Ibn Taymiyyah's family belonged. His grandfather, Abu al-Barkat Majd ad-Din ibn Taymiyyah al-Hanbali (d. 1255) and his uncle, Fakhr al-Din (d. 1225) were reputable scholars of the Hanbali school of law. Likewise, the scholarly achievements of ibn Taymiyyah's father, Shihab al-deen 'Abd al-Halim ibn Taymiyyah (d. 1284) were also well known. According to the book 'Rethinking Islamic Studies' edited by Carl W. Ernst and Richard C. Martin, Ibn Taymiyyah believed, non-Arab Muslims are inferior to Arab Muslims. In 1269, Ibn Taymiyyah, at the age of seven together with his father and three brothers left the city of Harran which was completely destroyed by the ensuing Mongol invasion. 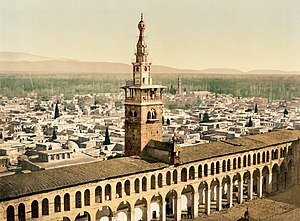 Ibn Taymiyyah's family moved and settled in Damascus, Syria, which at the time was ruled by the Mamluks of Egypt. In Damascus, his father served as the director of the Sukkariyya madrasa, a place where Ibn Taymiyyah also received his early education. Ibn Taymiyyah acquainted himself with the religious and secular sciences of his time. His religious studies began in his early teens, when he committed the entire Qur'an to memory and later on came to learn the Islamic disciplines of the Qur'an. From his father he learnt the religious science of Fiqh (jurisprudence) and Usul al-Fiqh (principles of jurisprudence). Ibn Taymiyyah learnt the works of Ahmad ibn Hanbal, al-Khallal, Ibn Qudamah and also the works of his grandfather, Abu al-Barakat Majd ad-Din. His study of jurisprudence was not limited to the Hanbali tradition but he also learnt the other schools of jurisprudence. The number of scholars under which he studied Hadith is said to number more than two hundred, four of whom were women. Those who are known by name amount to forty hadith teachers, as recorded by Ibn Taymiyyah in his book called Arba`un Hadithan. Serajul Haque says, based on this, Ibn Taymiyyah started to hear hadith from the age of five. One of his teachers was the first Hanbali Chief Justice of Syria, Shams ud-Din Al-Maqdisi who held the newly created position instituted by Baibars as part of a reform of the judiciary. Al-Maqdisi later on, came to give Ibn Taymiyyah permission to issue Fatawa (legal verdicts) when he became a mufti at the age of 17. Ibn Taymiyyah's secular studies led him to devote attention to Arabic language and Arabic literature by studying Arabic grammar and lexicography under Ali ibn `Abd al-Qawi al-Tuft. He went on to master the famous book of Arabic grammar, Al-Kitab, by the Persian grammarian Sibawayhi. He also studied mathematics, algebra, calligraphy, theology (kalam), philosophy, history and heresiography. The knowledge he gained from history and philosophy, he used to refute the prevalent philosophical discourses of his time, one of which was Aristotelian philosophy. Ibn Taymiyyah learnt about Sufism and stated that he had reflected on the works of; Sahl al-Tustari, Junayd of Baghdad, Abu Talib al-Makki, Abdul-Qadir Gilani, Abu Hafs Umar al-Suhrawardi and Ibn Arabi. At the age of 20 in the year 1282, Ibn Taymiyyah completed his education. Umayyad Mosque, a place where Ibn Taimiyya used to give lessons. After his father died in 1284, he took up the then vacant post as the head of the Sukkariyya madrasa and began giving lessons on Hadith. A year later he started giving lessons, as chair of the Hanbali Zawiya on Fridays at the Umayyad Mosque, on Fridays, on the subject of tafsir (exegesis of Qur'an). In November 1292, Ibn Taymiyyah performed the Hajj (pilgrimage to Mecca) and when he returned 4 months later, he wrote his first book aged twenty nine called Manasik al-Hajj (Rites of the Pilgrimage), in which he criticized and condemned the bid'ah's (innovations) which he saw take place there. Ibn Taymiyyah represented the Hanbali school of thought during this time. The Hanbali school was seen as the most traditional school out of the four legal systems (Hanafi, Maliki and Shafii) because it was "suspicious of the Hellenist disciplines of philosophy and speculative theology." He remained faithful throughout his life to this school, whose doctrines he had mastered, but he nevertheless called for ijtihad (independent reasoning by one who is qualified) and discouraged taqlid. Ibn Taymiyyah's emergence into the public and political sphere began in 1293 at the age of 30, when he was asked by the authorities to give an Islamic legal verdict (Fatwa) on Assaf al-Nasrani, a Christian cleric accused of insulting Muhammad. He accepted the invitation and delivered his fatwa, calling for the man to receive the death penalty. Despite the fact that public opinion was very much on Ibn Taymiyyah's side, the Governor of Syria attempted to resolve the situation by asking Assaf to accept Islam in return for his life, to which he agreed. This resolution was not acceptable to Ibn Taymiyyah who then, together with his followers, protested outside the Governor's palace demanding Assaf be put to death, on the grounds that any person—Muslim or non-Muslim—who insults Muhammad must be killed. This unwillingness to compromise coupled with his attempt to protest against the Governor's actions, resulted in him being punished with a prison sentence, the first of many such imprisonments to come. The French orientalist Henri Laoust says that during this incarceration Ibn Taymiyyah "wrote his first great work, al-Ṣārim al-maslūl ʿalā s̲h̲ātim al-Rasūl (The Drawn Sword against those who insult the Messenger)." Ibn Taymiyyah, together with the help of his disciples, continued with his efforts against what, "he perceived to be un-Islamic practices" and to implement what he saw as his religious duty of commanding good and forbidding wrong. Yahya Michot says that some of these incidences included: "shaving children's heads", leading "an anti-debauchery campaign in brothels and taverns", hitting an atheist before his public execution, destroying what was thought to be a sacred rock in a mosque, attacking astrologers and obliging "deviant Sufi Shaykhs to make public acts of contrition and to adhere to the Sunnah." Ibn Taymiyyah and his disciples used to condemn wine sellers and they would attack wine shops in Damascus by breaking wine bottles and pouring them onto the floor. A few years later in 1296, he took over the position of one of his teachers (Zayn al-Din Ibn al-Munadjdjaal), taking the post of professor of Hanbali jurisprudence at the Hanbaliyya madrasa, the oldest such institution of this tradition in Damascus. This is seen by some to be the peak of his scholarly career. The year he began his post at the Hanbaliyya madrasa, was a time of political turmoil. The Mamluk sultan Al-Adil Kitbugha was deposed by his vice-sultan Al-Malik al-Mansur Lajin who then ruled from 1297 to 1299. Lajin had a desire to commission an expedition against the Christians of the Armenian Kingdom of Cilicia who formed an alliance with the Mongol Empire and taking part of the military campaign which lead to the destruction of Baghdad the capital of the Abbasid Caliphate and Harran the birthplace of Ibn Taymiyyah, for that purpose he urged Ibn Taymiyyah to call the Muslims to Jihad. In 1298, Ibn Taymiyyah wrote an explanation of the ayat al-mutashabihat (the unclear verses of the Qur'an) called Al-`Aqidat al-Hamawiyat al-Kubra (The creed of the great people of Hama). The book is about divine attributes and it served as an answer to a question from the city of Hama, Syria. At that particular time Ash'arites held prominent positions within the Islamic scholarly community in both Syria and Egypt, and they held a certain position on the divine attributes of God. Ibn Taymiyyah in his book strongly disagreed with their views and this heavy opposition to the common Ash'ari position, caused considerable controversy. Ibn Taymiyyah collaborated once more with the Mamluks in 1300, when he joined the expedition against the Alawites , in the Kasrawan region of the Lebanese mountains. Ibn Taymiyyah thought of the Alawites as "more heritical yet than Jews and Christians," (بالنصيرية هم وسائر أصناف القرامطة الباطنية أكفر من اليهود والنصارى ; بل وأكفر من كثير من المشركين), and according to Carole Hillenbrand, the confrontation with the Alawites resulted because they "were accused of collaboration with Christians and Mongols." Ibn Taymiyya had further active involvements in campaigns against the Mongols and their alleged Alawite allies. Ibn Taymiyyah took part in a second military offensive in 1305 against the Alawites and the Isma`ilis in the Kasrawan region of the Lebanese mountains where they were defeated. The Alawis eventually left the region to settle in southern Lebanon. You claim that you are Muslim and you have with you Mu'adhdhins, Muftis, Imams and Shaykhs but you invaded us and reached our country for what? While your father and your grandfather, Hulagu were non-believers, they did not attack and they kept their promise. But you promised and broke your promise. 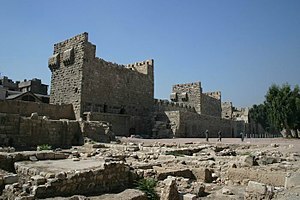 By early January 1300, the Mongol allies, the Armenians and Georgians, had caused widespread damage to Damascus and they had taken Syrian prisoners. The Mongols effectively occupied Damascus for the first four months of 1303. Most of the military had fled the city, including most of the civilians. Ibn Taymiyyah however, stayed and was one of the leaders of the resistance inside Damascus and he went to speak directily to the Mongol Ilkhan Mahmud Ghazan and his vizier Rashid al-Din Tabib. He sought the release of Muslim and dhimmi prisoners which the Mongols had taken in Syria, and after discussion, secured their release. An artist illustrated of Ghazan Khan, a historical figure harshly rebuked by Ibn Taymiyyah, mainly due to his constant state of hostility towards the Mamluks of Egypt. The second invasion lasted between October 1300 and January 1301. Ibn Taymiyyah at this time began giving sermons on Jihad at the Umayyad mosque. Ibn Taymiyyah also spoke to and encouraged the Governor of Damscus, al-Afram to achieve a victory against the Mongols. He became involved with al-Afram once more, when he was sent to get reinforcements from Cairo. The year 1303 saw the third Mongol invasion of Syria by Ghazan Khan. What has been called Ibn Taymiyyah's "most famous" fatwā was issued against the Mongols in the Mamluk's war. Ibn Taymiyyah declared that jihad against the Mongol attack on the Malmuk sultanate was not only permissible, but obligatory. The reason being that the Mongols could not, in his opinion, be true Muslims despite the fact that they had converted to Sunni Islam because they ruled using what he considered 'man-made laws' (their traditional Yassa code) rather than Islamic law or Sharia, whilst believing that the Yassa code was better than the Sharia law. Because of this, he reasoned they were living in a state of jahiliyyah, or pre-Islamic pagan ignorance. The fatwa broke new Islamic legal ground because "no jurist had ever before issued a general authorization for the use of lethal force against Muslims in battle," and was to influence modern Islamists in the use of violence against self-proclaimed Muslims. Ibn Taymiyyah called on the Muslims to Jihad once again and he also personally joined the eventual battle of Marj al-Saffar against the Mongol army. The battle began on 20 April of that year. On the same day, Ibn Taymiyyah declared a fatwa which exempted Mamluk soldiers from the fast during the month of Ramadan so that they could maintain their strength. Within two days the Mongols were severely defeated and the battle was won. Ibn Taymiyah was imprisoned several times for conflicting with the ijma of jurists and theologians of his day. From the city of Wasit, Iraq, a judge requested that Ibn Taymiyyah write a book on creed which led to him writing his book, for which he faced troubles, called Al-Aqidah Al-Waasitiyyah, a work on his view of the creed (`aqidah) of the salaf which included reference to the divine attributes of God. Ibn Taymiyyah adopted the view that God should be described as he was literally described in the Qur'an and in the hadith, and that all Muslims were required to believe this because according to him it was the view held by the early Muslim community (salaf). Within the space of two years (1305–1306) four separate religious council hearings were held to assess the correctness of his creed. The first hearing was held with the Shafii scholars who accused Ibn Taymiyyah of anthropomorphism. At the time Ibn Taymiyyah was 42 years old. He was protected by the then Governor of Damascus, Aqqush al-Afram, during the proceedings. The scholars suggested that he accept that his creed was simply that of the Hanbalites and offered this as a way out of the charge. The issue being, if Ibn Taymiyyah ascribed his creed to the Hanbali school of law then it would be just one view out of the four schools which one could follow rather than a creed everybody must adhere to. Ibn Taymiyyah was uncompromising and maintained that it was obligatory for all scholars to adhere to his creed. Two separate councils were held a year later on 22 and 28 of January 1306. The first council was in the house of the Governor of Damascus Aqqush al-Afram, who had protected him the year before when facing the Shafii scholars. A second hearing was held six days later where the Indian scholar Safi al-Din al-Hindi found him innocent of all charges and accepted that his creed was in line with the "Qur'an and the Sunna". Regardless, in April 1306 the chief Islamic judges of the Mamluk state declared Ibn Taymiyyah guilty and he was incarcerated. He was released four months later in September. After his release in Damascus, the doubts regarding his creed seemed to have resolved but this was not the case. A Shafii scholar, Ibn al-Sarsari, was insistent on starting another hearing against Ibn Taymiyyah which was held once again at the house of the Governor of Damascus, Al-Afram. His book Al-Aqidah Al-Waasitiyyah was still not found at fault. At the conclusion of this hearing, Ibn Taymiyyah and Ibn al-Sarsari were sent to Cairo to settle the problem. On arrival of Ibn Taymiyyah and the Shafi'ite scholar in Cairo in 1306, an open meeting was held. The Sultan of Egypt at the time was Al-Nasir Muhammad and his deputy attended the open meeting. Ibn Taymiyyah was found innocent. Despite the open meeting, objections regarding his creed continued and he was summoned to the Citadel in Cairo for a Munazara (legal debate), which took place on 8 April 1306. During the Munazara his views on divine attributes, specifically whether a direction could be attributed to God, were debated by the Indian Scholar Safi al-Din al-Hindi, in the presence of Islamic judges. Ibn Taymiyyah failed to convince the judges of his position and so on the recommendation of Al-Hindi was incarcerated for the charge of anthropomorphism. Thereafter, he together with his two brothers were imprisoned in the Citadel of the mountain (Qal'at al-Jabal), in Cairo until 25 September 1307. He was freed due to the help he received from two Amirs (ruler or military ruler); Salar and Muhanna ibn Isa, but he was not allowed to go back to Syria. He was then, again summoned for a legal debate but this time he convinced the judges of his views and he was allowed to go free. Ibn Taymiyyah continued to face troubles for his views which were found to be at odds with those of his contemporaries. His strong opposition to what he believed to be un-Islamic innovation (bid'ah), caused upset among the prominent Sufis of Egypt including Ibn `Ata'Allah and Karim al-Din al-Amuli, and the locals who started to protest against Ibn Taymiyyah. The nature of the point under contention was Ibn Taymiyyah's stance on tawassul (intercession). In his view a person could not ask anyone other than God for help except on the day of judgement when intercession in his view would be possible. At the time, the people did not restrict intercession to just the day of judgement but rather they said it was allowed in other cases. Due to this Ibn Taymiyyah, now 45, was ordered to appear before the Shafii judge Badr al-Din in March 1308 and was questioned on his stance regarding intercession. Thereafter, he was incarcerated in the prison of the judges in Cairo for some months. After his release, he was allowed to return to Syria, should he so wish. Ibn Taymiyyah however stayed in Egypt for a further 5 years. The year after his release in 1309 saw a change of power to a new Sultan in Egypt, Baibars al-Jashnakir whose reign was marked by economical and political unrest. His hold on power was short lived and lasted only a year. During this time, in August 1309, Ibn Taymiyyah was taken into custody and placed under house arrest for seven months in the new sultan's palace in Alexandria. He was freed when Al-Nasir Muhammad retook the position of sultan on 4 March 1310. Having returned to Cairo a week later, he was received by the sultan Al-Nasir. The sultan would sometimes consult Ibn Taymiyyah on religious affairs and policies during the rest of his three-year stay in Cairo. During this time he continued to teach and wrote his famous book Al-Kitab al-Siyasa al-shar'iyya (Treatise on the Government of the Religious Law), a book noted for its account of the role of religion in politics. He spent his last fifteen years in Damascus. Ibn Taymiyyah at the age of 50 returned to Damascus on 28 February 1313 by way of Jerusalem. Damascus was now under the governorship of Tankiz. In Damascus Ibn Taymiyyah continued his teaching role as professor of Hanbali fiqh. This is when he taught his most famous student, Ibn Qayyim Al-Jawziyya, who went on to become a noted scholar in Islamic history. Ibn Qayyim was to share in Ibn Taymiyyah's renewed persecution. Three years after his arrival in the city, Ibn Taymiyyah became involved in efforts to deal with the increasing Shia influence amongst Sunni Muslims. An agreement had been made in 1316 between the amir of Mecca and the Ilkhanate ruler Öljaitü, brother of Ghazan Khan, to allow a favourable policy towards Shi'ism in Mecca, a city that houses the holiest site in Islam, the Kaaba. Around the same time the Shia theologian Al-Hilli, who had played a crucial role in the Mongol rulers decision to make Shi'ism the state religion of Persia, wrote the book, Minhaj al-Karamah (The Way of Charisma'), which dealt with the Shia doctrine of the Imamate and also served as a refutation of the Sunni doctrine of the caliphate. To counter this Ibn Taymiyyah wrote his famous book, Minhaj as-Sunnah an-Nabawiyyah, as a refutation of Al-Hilli's work. In 1318, Ibn Taymiyyah wrote a treatise that would curtail the ease with which a Muslim man could divorce his wife. Ibn Taymiyyah's fatwa on divorce was not accepted by the majority of scholars of the time and this continued into the Ottoman era. However, almost every modern Muslim nation-state has come to adopt Ibn Taymiyyah's position on this issue of divorce. At the time he issued the fatwa, Ibn Taymiyyah revived an edict by the sultan not to issue fatwas on this issue but he continued to do so, saying, "I cannot conceal my knowledge". As in previous instances, he stated that his fatwa was based on the Qur'an and hadith. His view on the issue was at odds with the Hanbali doctrine. This proved controversial among the people in Damascus as well as the Islamic scholars and the authorities who were against him on the issue. According to the scholars of the time, an oath of divorce counted as a full divorce and they were also of the view that three oaths of divorce taken under one occasion counted as three separate divorces. The significance of this was, that a man who divorces the same partner three times is no longer allowed to remarry that person until and if that person marries and divorces another man. Only then could the man, who took the oath, remarry his previous wife. Ibn Taymiyyah accepted this but rejected the validity of three oaths taken under one sitting to count as three separate divorces as long as the intention was not to divorce. Moreover, Ibn Taymiyyah was of the view that a single oath of divorce uttered but not intended, also does not count as an actual divorce. He stated that since this is an oath much like an oath taken in the name of God, a person must expiate for an unintentional oath in a similar manner. Due to his views and also by not abiding to the sultan's letter two years before forbidding him from issuing a fatwa on the issue, three council hearings were held, in as many years (1318, 1319 and 1320), to deal with this matter. The hearing were overseen by the Viceroy of Syria, Tankiz. This resulted in Ibn Taymiyyah being imprisoned on 26 August 1320 in the Citadel of Damascus. He was released about five months and 8 days later, on 9 February 1321, by order of the Sultan Al-Nasir. Ibn Taymiyyah was reinstated as teacher of Hanbali law and he resumed teaching. Ibn Taymiyyah had written a risāla (a treatise) in 1310 called Ziyārat al-ḳubūr or according to another source, Shadd al-rihal. It dealt with the validity and permissibility of making a journey to visit the tombs of prophets and saints (Wali). It is reported that in the book "he condemned the cult of saints". He declared that, the one who visits the Prophet's grave commits innovation (bidah). Criticism of the book arose after nearly 16 years of Ibn Taymiyyah writing it and he was arrested and imprisoned at the age of 63, on 18 July 1326, in the Citadel of Damascus with an order from the sultan also prohibiting him from issuing any further fatwas. The reason for his arrest was his declaration that the one who travels to visit the Prophet's grave commits innovation (bidah). Hanbali scholar Aḥmad ibn Umar al-Maqdisī asserted Ibn Taymiyah to be a kafir over the Ziyara fatwa. His student Ibn Qayyim was also imprisoned with him in the Citadel. Ibn Taymiyyah referred to prison as "a divine blessing". During his incarceration he wrote that, "when a scholar forsakes what he knows of the Book of God and of the sunnah of his messenger and follows the ruling of a ruler which contravenes a ruling of God and his messenger, he is a renegade, an unbeliever who deserves to be punished in this world and in the hereafter." Whilst in prison he faced opposition from the Maliki and Shafii Chief Justices of Damascus, Taḳī al-Dīn al-Ik̲h̲nāʾī. He remained in prison for over two years and ignored the sultan's prohibition, by continuing to deliver fatwas. During his incarceration Ibn Taymiyyah wrote three works which are extant; Kitāb Maʿārif al-wuṣūl, Rafʿ al-malām, and Kitāb al-Radd ʿala 'l-Ik̲h̲nāʾī (The response to al-Ik̲h̲nāʾī). The last book was an attack on Taḳī al-Dīn al-Ik̲h̲nāʾī and explained his views on saints (wali). Ibn Taymiyyah fell ill in early September 1328 and died at the age of 65, on 26 September of that year, whilst in prison at the Citadel in Damascus. Once this news reached the public, there was a strong show of support for him from the people. After the authorities had given permission, it is reported that thousands of people came to show their respects. They gathered in the Citadel and lined the streets up to the Umayyad mosque which was and is still close by. A Janaza (funeral prayer) was held in the citadel by the sheikh, Muhammad Tammam, and a second was held in the mosque. A third and final funeral prayer was held by Ibn Taymiyyah's brother, the sheikh, Zain al-Din. He was buried in Damascus, in Maqbara Sufiyya (the cemetery of the Sufis). His brother Sharafuddin had been buried in that cemetery before him. Oliver Leaman says that being deprived of the means of writing led to Ibn Taymiyyah's death. It is reported that two hundred thousand men and fifteen to sixteen thousand women attended his funeral prayer. Ibn Kathir says that in the history of Islam, only the funeral of Ahmad ibn Hanbal received a larger attendance. This is also mentioned by Ibn `Abd al-Hadi. Caterina Bori says that, "In the Islamic tradition, wider popular attendance at funerals was a mark of public reverence, a demonstration of the deceased's rectitude, and a sign of divine approbation." Ibn Taymiyya is said to have "spent a lifetime objecting to tomb veneration, only to cast a more powerful posthumous spell than any of his Sufi contemporaries." On his death, his personal effects were in such demand "that bidders for his lice-killing camphor necklace pushed its price up to 150 dirhams, and his skullcap fetched a full 500." A few mourners sought and succeeded in "drinking the water used for bathing his corpse." His tomb received "pilgrims and sightseers" for 600 years. Almost 600 years after his death, the large Sufi cemetery where he was buried in was razed for redevelopment by French colonial authorities. His grave alone was left untouched after the Arab demolition teams "insisted" that his grave "was too holy to touch." His resting place is now "in the parking lot of a maternity ward", though as of 2009 its headstone was broken, according to author Sadakat Kadri. Many scholars have argued that Ibn Taymiyyah did not enjoy popularity among the intelligentsia of his day. Yossef Rapoport and Shahab Ahmed assert that he was a minority figure in his own times and the centuries that followed. Caterina Bori goes further, arguing that despite popularity Ibn Taymiyya may have enjoyed among the masses, he appears to have been not merely unpopular among the scholars of his day, but somewhat of an embarrassment. Khalid El-Rouayheb notes similarly that Ibn Taymiyyah had "very little influence on mainstream Sunni Islam until the nineteenth century." and that he was "a little-read scholar with problematic and controversial views" and that "The idea that Ibn Taymiyyah had an immediate and significant impact on the course of Sunni Islamic religious history simply does not cohere with the evidence that we have from the five centuries that elapsed between his death and the rise of Sunni revivialism in the modern period." On the other hand, Prof. Al-Matroudi of SOAS university says that Ibn Taymiyyah, "was perhaps the most eminent and influential Ḥanbalī jurist of the Middle Ages and one of the most prolific among them. He was also a renowned scholar of Islam whose influence was felt not only during his lifetime but extended through the centuries until the present day." Ibn Taymiyyah's followers often deemed him as Sheikh ul-Islam, an honorific title with which he is sometimes still termed today. Make sure you do not listen to what is in the books of Ibn Taymiyya and his student Ibn Qayyim al-Jawziyya and other such people who have taken their own whim as their God, and who have been led astray by God, and whose hearts and ears have been sealed, and whose eyes have been covered by Him... May God forsake the one who follows them, and purify the earth of their likes. Ibn Taymiyya is a servant whom God has forsaken, led astray, made blind and deaf, and degraded. Such is the explicit verdict of the leading scholars who have exposed the rottenness of his ways and the errors of his statements. Taqi al-Din al-Hisni condemned Ibn Taymiyya in even stronger terms by referring to him as the "heretic from Harran" and similarly, Munawi considered Ibn Taymiyyah to be an innovator though not an unbeliever. Taqi al-Din al-Subki criticised Ibn Taymiyyah for "contradicting the consensus of the Muslims by his anthropomorphism, by his claims that accidents exist in God, by suggesting that God was speaking in time, and by his belief in the eternity of the world." Ibn Battūta (d. 770/1369) famously wrote a work questioning Ibn Taymiyyah's mental state. The possibility of psychological abnormalities not with-standing, Ibn Taymiyya's personality, by multiple accounts, was fiery and oftentimes unpredictable. The historian Al-Maqrizi said, regarding the rift between the Sunni Ash'ari's and Ibn Taymiyyah, "People are divided into two factions over the question of Ibn Taymiyyah; for until the present, the latter has retained admirers and disciples in Syria and Egypt." Both his supporters and rivals grew to respect Ibn Taymiyyah because he was uncompromising in his views. Dhahabi's views towards Ibn Taymiyya were ambivalent. His praise of Ibn Taymiyya is invariably qualified with criticism and misgivings and he considered him to be both a "brilliant Shaykh" and also "cocky" and "impetuous". The Ash'ari scholar 'Ala' Al-Din Al-Bukhari said that anyone that gives Ibn Taymiyya the title Shaykh al-Islām is a disbeliever. Ibn Taymiyyah's works served as an inspiration for later Muslim scholars and historical figures, who have been regarded as his admirers or disciples. In the contemporary world, he may be considered at the root of Wahhabism, the Senussi order and other later reformist movements. Ibn Taymiyyah has been noted to have influenced Rashid Rida, Abul A`la Maududi, Sayyid Qutb, Hassan al-Banna, Abdullah Azzam, and Osama bin Laden. The terrorist organization Islamic State in Iraq and the Levant used a fatwa of Ibn Taymiyyah to justify the burning alive of Jordanian pilot Muath al-Kasasbeh. Ibn Taymiyyah's fatwa on Alawites as "more infidel than Christians and Jews" has been recited by Muslim Brotherhood affiliated scholar Yusuf al-Qaradawi and the Syrian rebel Islamist leader of Jaysh al-Islam Zahran Alloush. The generally positive perception of Ibn Taymiyyah among Salafi Muslims prompted the head of the Israel Defense Forces IDF Spokesperson's Unit's head of the Arab Media Division, Avichay Adraee, to release a video in which he called upon the Sunni Hamas movement to dissociate from Iran, citing Ibn Taymiyyah's views on Shiites as deceptive. Ibn Taymiyyah was taught by scholars who were renowned in their time. However, there is no evidence that any of the contemporary scholars influenced him. A strong influence on Ibn Taymiyyah was the founder of the Hanbali school of Islamic jurisprudence, Ahmad ibn Hanbal. Ibn Taymiyyah was trained in this school and he had studied Ibn Hanbal's Musnad in great detail, having studied it over multiple times. Though he spent much of his life following this school, in the end he renounced taqlid (blind following). His work was most influenced by the sayings and actions of the Salaf (first 3 generation of Muslims) and this showed in his work where he would give preference to the Salaf over his contemporaries. The modern Salafi movement derives its name from this school of thought. Ibn Taymiyyah said that God should be described as he has described himself in the Qur'an and the way Prophet Muhammad has described God in the Hadith. He rejected; the Ta'tili's who denied these attributes, those who compare God with the creation (Tashbih) and those who engage in esoteric interpretations (ta'wil) of the Qur'an or use symbolic exegesis. Ibn Taymiyyah said that those attributes which we know about from the two above mentioned sources, should be ascribed to God. Anything regarding God's attributes which people have no knowledge of, should be approached in a manner, according to Ibn Taymiyyah, where the mystery of the unknown is left to God (called tafwid) and the Muslims submit themselves to the word of God and the Prophet (called taslim). Henri Laoust says that through this framework, this doctrine, "provides authority for the widest possible scope in personal internationalization of religion." In 1299,Ibn Taymiyyah wrote the book Al-Aqida al-hamawiyya al-kubra, which dealt with, among other topics, theology and creed. When he was accused of anthropomorphism, a private meeting was held between scholars in the house of Al-Din `Umar al-Kazwini who was a Shafii judge. After careful study of this book, he was cleared of those charges. Ibn Taymiyyah also wrote another book dealing with the attributes of God called, Al-Aqidah Al-Waasitiyyah. He faced considerable hostility towards these views from the Ash'ari's of whom the most notable were, Taqi al-Din al-Subki and his son Taj al-Din al-Subki who were influential Islamic jurists and also chief judge of Damascus in their respective times. Ibn Taymiyyah's highly intellectual discourse at explaining "The Wise Purpose of God, Human Agency, and the Problems of Evil & Justice" using God's attributes as a means has been illustrated by Dr. Jon Hoover in his work Ibn Taymiyyah's Theodicy of Perpetual Optimism. Ibn Taymiyyah held the belief that Hell was not eternal even for unbelievers. According to Ibn Taymiyyah, Hell is therapeutic and reformative, and God's wise purpose in chastising unbelievers is to make them fit to leave the Fire. This view contradicted the mainstream Sunni doctrine of eternal hell-fire for unbelievers. Ibn Taymiyyah was criticised for holding this view by the chief Shafi scholar Taqi al-Din al-Subki who presented a large body of Qur'anic evidence to argue that unbelievers will abide in hell-fire eternally. Ibn Taymiyyah was partially supported in his view by the Zaydi Shi'ite Ibn al-Wazir. —Ibn Taymiyyah opposed the use of consensus of jurists, replacing it with the consensus of the "companions" (sahaba). Like all Islamic jurists Ibn Taymiyyah believed in a hierarchy sources for the Sharia. Most important was the Quran, and the sunnah or any other source could not abrogate a verse of the Qur'an. (For him, an abrogation of a verse, known in Arabic as Naskh, was only possible through another verse in the Qur'an.) Next was sunnah which other sources (besides the Quran) must not contradict. Concerning Consensus (ijma), he believed that consensus of any Muslims other than that of the companions of Muhammad could not be "realistically verifiable" and so was speculative, and thus not a legitimate source of Islamic law (except in certain circumstances). The consensus (ijma) used must be that of the companions found in their reported sayings or actions. According one supporter, Serajul Haque, his rejection of the consensus of other scholars was justified, on the basis of the instructions given to the jurist Shuraih ibn al-Hârith from the Caliph Umar, one of the companions of Muhammad; to make decisions by first referring to the Qur'an, and if that is not possible, then to the sayings of the Prophet and finally to refer to the agreement of the companions like himself. An example of Ibn Taymiyyah use of his interpretation was in defense of the (temporary) closing of all Christian churches in 1299 in the Mamluk Sultanate of Egypt. The closing was in violation of a 600-year-old covenant with Christian dhimmi known as the Pact of Umar. But as Ibn Taymiyyah pointed out, while venerable, the pact was written 60 years or so after the time of the companions and so had no legal effect. Ibn Taymiyyah considered the use of analogy (qiyas) based on literal meaning of scripture as a valid source for deriving legal rulings. Analogy is the primary instrument of legal rationalism in Islam. He acknowledged its use as one of the four fundamental principles of Islamic jurisprudence. Ibn Taymiyyah argued against the certainty of syllogistic arguments and in favour of analogy (qiyas). He argues that concepts founded on induction are themselves not certain but only probable, and thus a syllogism based on such concepts is no more certain than an argument based on analogy. He further claimed that induction itself depends on a process of analogy. His model of analogical reasoning was based on that of juridical arguments. Work by John F. Sowa have, for example, have used Ibn Taymiyyah's model of analogy. He attached caveats however to the use of analogy because he considered the use of reason to be secondary to the use of revelation. Ibn Taymiyyah's view was that analogy should be used under the framework of revelation, as a supporting source. There were some jurists who thought rulings derived through analogy could contradict a ruling derived from the Qur'an and the authentic hadith. However, Ibn Taymiyyah disagreed because he thought a contradiction between the definitive canonical texts of Islam, and definitive reason was impossible and that this was also the understanding of the salaf. Racha el-Omari says that on an epistemological level, Ibn Taymiyyah considered the Salaf to be better than any other later scholars in understanding the agreement between revelation and reason. One example for this is the use of analogy in the Islamic legal principle of maslaha (public good) about which Ibn Taymiyya believed, if there were to be any contradiction to revelation then it is due to a misunderstanding or misapplication of the concept of utility. He said that to assess the utility of something, the criteria for benefit and harm should come from the Qur'an and sunnah, a criteria which he also applied to the establishment of a correct analogy. An example of Ibn Taymiyyah's use of analogy was in a fatwa forbidding the use of hashish one the grounds that it was analogous to wine, and users should be given 80 lashes in punishment. "Anyone who disagreed was an apostate, he added, whose corpse ought not to be washed or given a decent burial." Issues surrounding the use of reason ('Aql) and rational came about in relation to the attributes of God for which he faced much resistance. At the time the Islamic scholars thought the attributes of God as stated in the Qur'an were contradictory to reason so sought other explanations instead. Ibn Taymiyyah believed that reason itself validated the entire Qur'an as being reliable and in light of that he argued, if some part of the scripture was to be rejected then this would render the use of reason as an unacceptable avenue through which to seek knowledge. He thought that the most perfect rational method and use of reason was contained within the Qur'an and sunnah and that the theologians of his time had used rational and reason in a flawed manner. Ibn Taymiyyah had mastered the grammar of Arabic and one of the books which he studied was the book of Arabic grammar called Al-Kitab, by Sibawayh. In later life he met the Qur'an commentator Abu Hayyan al-Gharnati to whom he expressed that, "Sibawayh was not the Prophet of Syntax nor was he infallible. He committed eighty mistakes in his book which are not intelligible to you." Ibn Taymiyyah is thought to have severely criticized Sibawayh but the actual substance of those criticisms is not known because the book that Ibn Taymiyyah wrote, al-Bahr, within which he wrote the criticisms has been lost. He stated that when there is an explanation of an Ayah of the Qur'an or a Hadith, from the Prophet himself, the use of philology or a grammatical explanation becomes obsolete. He also said one should refer only to the understanding of the Salaf (first three generations of Muslims) when interpreting a word within the scriptural sources. However he did not discount the contributions of the grammarians completely. Ibn Taymiyyah stated that the Arabic nouns within the scriptural sources have been divided by the fuqaha (Islamic jurists) into three categories; those that are defined by the shari'a, those defined by philology (lugha) and finally those that are defined by social custom (`urf). For him each of these categories of nouns had to be used in their own appropriate manner. Ibn Taymiyyah censured the scholars for blindly conforming to the precedence of early jurists without any resort to the Qur'an and Sunnah. He contended that although juridical precedence has its place, blindly giving it authority without contextualization, sensitivity to societal changes, and evaluative mindset in light of the Qur'an and Sunnah can lead to ignorance and stagnancy in Islamic Law. Ibn Taymiyyah likened the extremism of Taqlid (blind conformity to juridical precedence or school of thought) to the practice of Jews and Christians who took their rabbis and ecclesiastics as gods besides God. In arguing against taqlid, he said the salaf, who in order to better understand and live according to the commands of God, had to make ijtihad using the scriptural sources. The same approach, in his view, was needed in modern times. Ibn Taymiyyah believed that the best role models for Islamic life were the first three generations of Islam (Salaf); which constitute Muhammad's companions, referred to in Arabic as Sahaba (first generation), followed by the generation of Muslims born after the death of Muhammad known as the Tabi'un (second generation) which is then followed lastly by the next generation after the Tabi'un known as Tabi' Al-Tabi'in (third generation). Ibn Taymiyyah gave precedence to the ideas of the Sahaba and early generations, over the founders of the Islamic schools of jurisprudence. For Ibn Taymiyyah it was the Qur'an, the sayings and practices of Muhammad and the ideas of the early generations of Muslims that constituted the best understanding of Islam. Any deviation from their practice was viewed as bid'ah, or innovation, and to be forbidden. He also praised and wrote a commentary on some speeches of Abdul-Qadir Gilani. Ibn Taymiyya believed that Islamic policy and management was based on Quran 4:58, and that the goal of al-siyasa (politics, the political) should be to protect al-din (religion) and to manage al-dunya (worldly life and affairs). Religion and the State should be inextricably linked, in his view, as the state was indispensable in providing justice to the people, enforcing Islamic law by enjoining good and forbidding evil, unifying the people and preparing a society conducive to the worship of God. He believed that "enjoining good and forbidding wrong" was the duty of every state functionary with charge over other Muslims, from the caliph to "the schoolmaster in charge of assessing children's handwriting exercises." Ibn Taymiyyah supported giving broad powers to the state. In Al-siyasa al-Shar`iyah, he focused on duties of individuals and punishments rather than rules and procedural limits of authorities. Suspected highway robbers who would not reveal their accomplices or the location of their loot, for example should be held in detention and lashed for indefinite periods. He also allowed the lashing of imprisoned debtors, and "trials of suspicion" (da`sawi al-tuham) where defendants could be convicted without witnesses or documentary proof. Henri Laoust said that Ibn Taymiyyah never propagated the idea of a single caliphate but believed the Muslim ummah or community would form into a confederation of states. Laoust further stated that Ibn Taymiyyah called for obedience only to God, and the Islamic Prophet Muhammad, and he did not put a limit on the number of leaders a Muslim community could have. However Mona Hassan, in her recent study of the political thoughts of Ibn Taymiyyah, questions this and says laoust has wrongly claimed that Ibn Taymiyyah thought of the caliphate as a redundant idea. Hassan has shown that Ibn Taymiyyah considered the Caliphate that was under the Rashidun Caliphs; Abu Bakr, Umar, Uthman, and Ali, as the moral and legal ideal. The Caliphate in his view could not be ceded "in favour of secular kingship (mulk). Ibn Taymiyyah was noted for emphasis he put on the importance of jihad and for the "careful and lengthy attention" he gave "to the questions of martyrdom" in jihad, such as benefits and blessings to be had for martyrs in the afterlife. He asserted that martyrdom and eternal rewards and blessings, . He wrote that, "It is in jihad that one can live and die in ultimate happiness, both in this world and in the Hereafter. Abandoning it means losing entirely or partially both kinds of happiness." It comprehends all sorts of worship, whether inward or outward, including love for Allah, being sincere to Him, relying on Him, relinquishing one's soul and property for His sake, being patient and austere, and keeping remembrance of Almighty Allah. It includes what is done by physical power, what is done by the heart, what is done by the tongue through calling to the way of Allah by means of authoritative proofs and providing opinions, and what is done through management, industry, and wealth. It is allowed to fight people for (not observing) unambiguous and generally recognized obligations and prohibitions, until they undertake to perform the explicitly prescribed prayers, to pay zakat, to fast during the month of Ramadan, to make the pilgrimage to Mecca and to avoid what is prohibited, such as marrying women in spite of legal impediments, eating impure things, acting unlawfully against the lives and properties of Muslims and the like. It is obligatory to take the initiative in fighting those people, as soon as the Prophet's summons with the reasons for which they are fought has reached them. But if they first attack the Muslims then fighting them is even more urgent, as we have mentioned when dealing with the fighting against rebellious and aggressive bandits. In the modern context, his rulings have been used by some Islamist groups to declare jihad against various governments. Even though Ibn Taymiyyah has been called a theologian, he claimed to reject `ilm al-kalam, known as Islamic theology, as well as some aspects of Sufism and Peripatetic philosophy, as an innovation (Bid'ah). Despite this, Ibn Taymiyyah's works contained numerous arguments that openly refer to rational arguments (kalam) for their validity and therefore he must be included amongst the Mutakallimin. Ibn Taymiyyah opposed giving any undue religious honors to mosques (even that of Jerusalem, the Al-Aqsa Mosque), to approach or rival in any way the Islamic sanctity of the two most holy mosques within Islam, Masjid al-Haram (in Mecca) and Al-Masjid al-Nabawi (in Madina). As to the practice of making journey for the sole purpose of visiting a mosque, Ibn Taymiyyah has said in his books; Majmu'at al-Rasail al-Kubra, Minhaj al-Sunna and Majmu'at Fatawa, that, "Journey must not be made except to three mosques; Masjid al-Haram, Masjid al-Nabawi and Masjid Al-Aqsa". Regarding this Serajul Haque says that, "In the opinion of Ibn Taymiyyah only these three mosques have been accepted by the Prophet as the object of journeys, on account of their excellence over all other mosques and places of prayer. Ibn Taymiyyah uses a saying (hadith) of the Islamic prophet Muhammad in Bukhari and Muslim to justify his view that it is not permitted to journey exclusively to any mosque than Mecca, Medina, or Jerusalem. Although it is sometimes supposed that Ibn Taymiyyah rejected the very idea of saints, which had become a cardinal Sunni belief in the medieval period, scholarship has shown that this is not true. Indeed, while Ibn Taymiyyah did indeed reject widely-established orthodox practices associated with the veneration of saints in Islam at his time, like the visitation to their graves and the seeking of their intercession, he never rejected the actual existence of saints as such. On the contrary, he explicitly states: "The miracles of saints are absolutely true and correct, by the acceptance of all Muslim scholars. And the Qur'an has pointed to it in different places, and the sayings of the Prophet have mentioned it, and whoever denies the miraculous power of saints are only people who are innovators and their followers." In this particular respect, he differed little from all his contemporaries; for just as practically all of the era's scholars believed that "the lives of saints and their miracles were incontestable," so also did Ibn Taymiyyah. Ibn Taymiyyah's most categorical declaration of accepting the existence of saints and their miracles appears in his famous creed 'Aqīda al-Wāsitīya, in which he states: "Among the fundamentals of the belief of the People of the Sunna is belief in the miracles of the saints (karāmāt al-awliyā) and the supernatural acts which God achieves through them in all varieties of knowledge, illuminations (mukāshafāt), power, and impressions as it is handed down about the ancient nations in the chapter of the Cave and in other Quranic chapters and is known of the early men among this Community of Believers among the Companions and Followers and the rest of the generations of this Community of Believers. It [the blessing of having saints and saintly miracles] will be with them until the Day of Resurrection." Although Ibn Taymiyyah was critical of some of the developments within Sufism, he never rejected the practice outright, and actually enumerated a list of early Sufis whom he considered to be among the greatest Islamic saints. In this list, he included Bayazid Bastami, Junayd of Baghdad, Abdul-Qadir Gilani, Hasan of Basra, Ibrahim ibn Adham, Maruf Karkhi, Sirri Saqti, and several other venerable personages who have always been venerated in mainstream Sunni Islam as being among the greatest saints of all. Regarding all these early saints, Ibn Taymiyyah even declares: "These great Sufi people were the leaders of humanity, and they were calling to what is right and forbidding what is wrong." While Ibn Taymiyyah did indeed reject the veneration of saints who promulgated the Akbari doctrine of wahdat al-wajud, he never rejected the venerability of saints who belonged to all the other Sufi orders. Ibn Taymiyyah considered the visitation of the tombs of Prophets and saints as impermissible, a blameworthy innovation and comparable to worshiping something besides God (Shirk). This view was vigorously rejected by mainstream Sunni scholars both during his life and after his death. The Shafi'i hadith master Ibn Hajar al-Asqalani stated that "This is one of the ugliest positions that has been reported of Ibn Taymiyya" and also added that travelling to visit the tomb of the Prophet was "one of the best of actions and the noblest of pious deeds with which one draws near to God, and its legitimacy is a matter of consensus." The Hanafi hadith scholar Ali al-Qari stated that, "Amongst the Hanbalis, Ibn Taymiyya has gone to an extreme by prohibiting travelling to visit the Prophet – may God bless him and grant him peace" Qastallani stated that "The Shaykh Taqi al-Din Ibn Taymiyya has abominable and odd statements on this issue to the effect that travelling to visit the Prophet is prohibited and is not a pious deed." Other scholars in opposition to Ibn Taymiyyah's views include Ghazali, Nawawi, Munawi and Qadi Ayyad who stated that visiting the Prophet was "a sunna of the Muslims on which there was consensus, and a good and desirable deed." Ibn Taymiyyah said that seeking the assistance of God through intercession is allowed, as long as the other person is still alive. However, he believed that those who ask assistance from the grave of the Prophet or saints, are mushrikin (polytheists), someone who is engaged in shirk. This view was also vigorously rejected by mainstream Sunni scholars. For example, the chief judge of Damascus, Taqi al-Din al-Subki stated that, "It is proper to entreat and ask for the help and intercession of the Prophet ﷺ with God. No one from amongst the salaf and khalaf denied this, until Ibn Taymiyya came along and disapproved of this, and deviated from the straight path, and invented a position that no scholar has said before, and he became a deterrent example for Muslims". Similarly, Ibn Hajar rejected Ibn Taymiyya's view on intercession and held that he had broken with the established consensus of Sunni scholars, as did many other scholars such as Zurqani and Khalil ibn Ishaq. The mutakallimun are scholars who engage in ilm al-Kalam (rationalist theology) and they were criticised by Ibn Taymiyyah for their use of rationalist theology and philosophy. He said that the method of kalam was used by the Mu`tazilites, Jahmites and Ash`ari's. Ibn Taymiyyah considered the use of philosophical proofs and kalam to be redundant because he saw the Qur'an and the Sunna as superior rational proofs. Ibn Taymiyyah said that these explanations were not grounded in scriptural evidence such as the philosophical explanation of the divine attributes of God or the proof of God using the cosmological argument. He said that the call to Islam was not made using such methods by the Qur'an or the Prophet and that these theories have only caused errors and corruption. The mutakallimun called their use of rationalist theology usul al-din (principles of religion) but Ibn Taymiyyah said that the use of rationalist theology has nothing to do with the true usul al-din which comes from God and to state otherwise is to say that the Prophet neglected an important aspect of Islam. Ibn Taymiyyah says that the usul al-din of the mutakallimun, deserve to be named usul din al-shaytan (principles of Satanic religion). Ibn Taymiyyah's attempts to focus attention onto Qur'anic rationality was taken up by his student Ibn Qayyim, to the exception of his other followers. This focus on traditionlist rationlism was also taken up by Musa Bigiev. Ibn Taymiyyah belonged to the Qadiriyya tariqa (order) of Sufism and claimed to inherit the khirqa (spiritual mantle) of the founder of the Qadiriyya order 'Abd al-Qadir al-Jilani. Among his explicit positive references to Sufism and the Qadiriyya tariqa in particular, Ibn Taymiyyah referred to Jilani as "Shaykhuna" (our Shaykh) and "Sayyidi" (my master). He spoke highly of a great many other Sufi Shaykhs also such as Abu Yazid al-Bistami and al-Junayd. and went to great lengths to state that Sufism is not a heretical innovation (bid'ah). Despite this, Ibn Taymiyyah rejected two views associated with some Sufis. Firstly, he rejected monism which he believed was similar to the pantheistic belief that God "encompasses all things". This rejection included denouncing the views of Ibn Arabi. Secondly he said that the view that spiritual enlightenment is of a greater importance than obeying the sharia was a failure to properly follow the example of Muhammad. On Ibn Arabi, and Sufism in general, Henri Laoust says that Ibn Taymiyyah never condemned Sufism in itself, but only that which he considered to be, inadmissible deviations in doctrine, ritual or morals, such as monism, antinomianism or esotericism. Ibn Taymiyyah was extremely critical of Shia and considered them religiously bankrupt, among the most morally depraved people and the root cause of many Islamic ills. His severe critique of Twelver Shia in his book, Minhaj as-Sunnah an-Nabawiyyah, was written in response to the book Minhaj al-karama fi ma'rifat al-imama, by the Shia theologian Al-Hilli. He focused his criticisms to the similarity between Shia, Christians and Jews. Regarding the Shia mourning for Husayn on Ashura, Ibn Taymiyyah considered Husayn's martyrdom as a divinely bestowed honour—not a major tragedy. He also argued that such mourning was never instructed by Muhammad and that the Islamic response to recent (let alone ancient) loss is not extravagant mourning but to endure the loss with patience and trust in God. However, he also believed those who celebrated on Ashura were anti-Shia zealots ("an-Nāṣibiyyah") or ignorant people. He wrote polemics against Christians. Ibn Taymiyyah witnessed conversions to Islam as a growing trend among many Mongols. Ibn Taymiyyah strongly opposed borrowing from Christianity or other non-Muslim religions. In his text On the Necessity of the Straight Path (kitab iqtida al-sirat al-mustaqim) he preached that the beginning of Muslim life was the point at which "a perfect dissimilarity with the non-Muslims has been achieved." To this end he opposed the celebration of the observance of the birthday of the Islamic prophet Muhammad or the construction of mosques around the tombs of Muslim saints saying: "Many of them (the Muslims) do not even know of the Christian origins of these practices." He elaborated a circumstantial analysis of market mechanism, with a theoretical insight unusual in his time. Regarding the power of supply and demand, Ibn Taymiyyah said, "If desire for goods increases while its availability decreases, its price rises. On the other hand, if availability of the good increases and the desire for it decreases, the price comes down." His discourses on the welfare advantages and disadvantages of market regulation and deregulation, have an almost contemporary ring to them. However, he also advocated a policy of "fair prices" and "fair profits", with the implication that anything higher would be impious. Such forms of price fixing was detrimental to entrepreneurship. He argued that there was an alternate view to the view held by philosophers, like Ibn Sina, who claimed the universe was eternal in its entirety, and Islamic scholars, like Fakhr al-Din al-Razi, who claimed that the universe was created from nothing by God. In his Sharh Hadith Imran ibn Hasan, Ibn Taymiyya distinguishes between species and elements, asserting that the former are eternal with God. He states: "If it is supposed that the species [of things done] has been with Him from eternity, neither revelation nor reason denies this 'withness' (ma^iyya). On the contrary, it is part of His perfection." In fact, Ibn Taymiyya draws this assertion from his belief that God perpetually creates, i.e. in preeternity. John Hoover, in his Perpetual Creativity In The Perfection Of God: Ibn Taymiyya's Hadith Commentary On God's Creation Of This World, elaborates, "Following in the footsteps of Ibn Sina and Ibn Rushd, Ibn Taymiyya then roots God's perpetual creativity in a Neoplatonic concept of God's perfection. Power and creativity are necessary concomitants of God's perfection. If God's creativity were not perpetual, God would have been devoid of His creativity, as well as other attributes of perfection, in pre-eternity." Ibn Taymiyyah is thought by some to be the main influence behind the emergence of Salafism. He placed an emphasis on understanding Islam as it was understood by the salaf (first three generations of Muslims). A second concept is making a declaration of apostasy (takfir) against a Muslim who does not obey Islam. But at the same time Ibn Taymiyyah maintained that no one can question anothers faith and curse them as based on one's own desire, because faith is defined by God and the Prophet. He said, rather than cursing or condemning them, an approach should be taken where they are educated about the religion. A further concept attributed to Ibn Taymiyyah is, "the duty to oppose and kill Muslim rulers who do not implement the revealed law (shari'a). Ibn Taymiyyah's role in the Islamist movements of the twentieth and twenty first century have also been noted by, the previous Coordinator for Counterterrorism at the United States Department of State, Daniel Benjamin who labels the chapter on the history of modern Islamic movements in his book The Age of Sacred Terror, as "Ibn Taymiyya and His children". Yossef Rapoport, a reader in Islamic history at Queen Mary, however, says this is not a probable narrative. One of Ibn Taymiyyah's most famous fatwas is regarding the Mongols who had conquered and destroyed the Abbasid caliphate in 1258 and had then converted to Islam. Once they were in control of Mardin, they behaved unjustly with their subjects so the people of Mardin asked Ibn Taymiyyah for a legal verdict regarding the classification of the territory under which they live. He categorized the territory as dar al-`ahd which in some ways is similar to dar al-kufr (domain of unbelievers). Included in his verdict was declaring the Mongol ruler Ghazan and other Mongols who did not accept shari'a in full, as unbelievers. According to Nettler and Kéchichian, Ibn Taymiyyah affirmed that Jihad against the Mongols, "was not only permissible but obligatory because the latter ruled not according to Sharīʿah but through their traditional, and therefore manmade, Yassa code. This essentially meant that Mongols were living in a state of jāhilīyah (ignorance)." The authors further state that his two famous student, Ibn Qayyim and Ibn Kathir, agreed with this ruling. He called for a defensive jihad to mobilise the people to kill the Mongol rulers and any one who supported them, Muslim or non-Muslim. Ibn Taymiyyah when talking about those who support the Mongols said, "Everyone who is with them (Mongols) in the state over which they rule has to be regarded as belonging to the most evil class of men. He is either an atheist (zindīq) or a hypocrite who does not believe in the essence of the religion of Islam. This means that he (only) outwardly pretends to be Muslim or he belongs to the worst class of all people who are the people of the bida` (heretical innovations)." Yahya Mochet says that, Ibn Taymiyyah's call to war was not simply to cause a "rebellion against the political power in place" but to repel an "external enemy". In 2010, a group of Islamic Scholars at the Mardin conference argued that Ibn Taymiyyah's famous fatwa about the residents of Mardin when it was under the control of the Mongols was misprinted into an order to "fight" the people living under their territory, whereas the actual statement is, "The Muslims living therein should be treated according to their rights as Muslims, while the non-Muslims living there outside of the authority of Islamic Law should be treated according to their rights." They have based their understanding on the original manuscript in the Al-Zahiriyah Library, and the transmission by Ibn Taymiyyah's student Ibn Muflih. The participants of the Mardin conference also rejected the categorization of the world into different domains of war and peace, stating that the division was a result of the circumstances at the time. The participants further stated that the division has become irrelevant with the existence of nation states. However, some recent scholarship has argued that attempts by Salafis and Jihadis to portray the figure of Ibn Taymiyyah as being a direct classical precursor of their own beliefs are flawed inasmuch as they are often borne, according to these same scholars, of a limited reading of the theologian's substantial corpus of works, many of which have not yet been translated from the original Arabic. James Pavlin, for example, has argued: "Ibn Taymiyya remains one of the most controversial Islamic thinkers today because of his supposed influence on many fundamentalist movements. The common understanding of his ideas have been filtered through the bits and pieces of his statements that have been misappropriated by ... [his] alleged supporters." Additionally, Abdul Haq Ansari has argued that the ubiquitous notion that Ibn Taymiyyah rejected Sufism outright is erroneous, for while "the popular image of Ibn Taymiyyah [is] ... that he [criticized] Sufism indiscriminately ... [was] deadly against the Sufis, and ... [saw] no place for Sufism in Islam," it is historically known, according to the same scholar, that Ibn Taymiyyah actually considered Sufism an essential part of Islam, being on the whole "sympathetic" towards what everyone at the time considered an integral part of Islamic life. Indeed, "far from saying [Sufism] has no place in Islam," Ibn Taymiyyah, according to the same author, seems to have wanted to reform the practice of medieval Sufism as part of his wider aim to reform Sunni Islam (of which Sufism was a fundamental component at the time) by divesting both these traditions of what he perceived to be heretical innovations within them. Moreover, these scholars also point out that Ibn Taymiyyah had a deep reverence and appreciation for the works of such major Sufi saints as Junayd, Sahl al-Tustari, Abu Talib al-Makki, and even Bayazid Bastami, and was part of the Qadiriyya Sufi order himself. A Great Compilation of Fatwa (Majmu al-Fatwa al-Kubra) This was collected centuries after his death, and contains several of the works mentioned below – Thirty six volumes. Minhaj as-Sunnah an-Nabawiyyah (The way of the Prophet's Sunna) – Four volumes. Al-Jawāb al-Ṣaḥīḥ li-man baddala dīn al-Masīh (Literally,"The Correct Response to those who have Corrupted the Deen (Religion) of the Messiah"; A Muslim theologian's response to Christianity) – Seven Volumes. Darʾ taʿāruḍ al-ʿaql wa al-naql ("Averting the Conflict between Reason and [religious] Tradition"). Also, called Al-Muwāfaqa (Harmony) – Ten volumes. as-Sarim al-Maslul 'ala Shatim ar-Rasul—The Drawn Sword against those who insult the Messenger. Written in response to an incident in which Ibn Taymiyyah heard a Christian insulting Muhammad. al-Bahr al-Muhit – Forty volumes tafsir of the Qur'an (written in the prison of Damascus) – Ibn Hajar al`Asqalani mentions the existence of this work in his book, al-Durar al-Kamina. Rapoport, Yossef (9 April 2010). Ibn Taymiyya and His Times. OUP Pakistan. ISBN 0-19-547834-7. Hoover, Jon (28 May 2007). Ibn Taymiyya's Theodicy of Perpetual Optimism. Brill. ISBN 9004158472. P. J. Bearman; Th. Bianquis; C. E. Bosworth; E. van Donzel; W. P. Heinrichs (eds.). Encyclopaedia of Islam Online. Brill Academic Publishers. ISSN 1573-3912. ^ Halverson, Jeffry R. (2010). Theology and Creed in Sunni Islam. Palgrave Macmillan. p. 48. ISBN 978-0-230-10279-8. ^ Spevack, Aaron (2014). The Archetypal Sunni Scholar: Law, Theology, and Mysticism in the Synthesis of Al-Bajuri. State University of New York Press. p. 45. ISBN 978-1-4384-5370-5. ^ a b c d Spevack, Aaron (2014). The Archetypal Sunni: Law, Theology, and Mysticism in the Synthesis of Al-Bajuri. State University of New York Press. p. 91. ISBN 978-1438453712. ^ a b c Rapoport, Yossef; Ahmed, Shahab (2010-01-01). Ibn Taymiyya and His Times. Oxford University Press. p. 334. ISBN 9780195478341. ^ a b c Halverson, Jeffry R. (2010). Theology and Creed in Sunni Islam: The Muslim Brotherhood, Ash'arism, and Political Sunnism. Palgrave Macmillan. pp. 48–49. ISBN 978-0230102798. ^ Jonathan A.C. Brown. "Salafism – Islamic Studies – Oxford Bibliographies". Oxford Bibliographies. Retrieved 10 February 2015. ^ Ibn Taymiyyah, Ahmad ibn ʻAbd al-Ḥalīm (1999). Kitab Al-Iman. Kuala Lumpur: Islamic Book Trust. ISBN 978-967-5062-28-5. Retrieved 16 January 2015. ^ a b "Ibn Taymiyyah". Encyclopædia Britannica. Retrieved 16 January 2015. ^ a b c d e Haque, Serajul (1982). Imam Ibn Taimiya and his projects of reform. Islamic Foundation Bangladesh. ^ Kepel, Gilles (2003). Jihad: The Trail of Political Islam. ISBN 9781845112578. ^ Wiktorowicz, Quintan (2005). "A Genealogy of Radical Islam" (PDF). Studies in Conflict & Terrorism. 28 (2): 75–97. doi:10.1080/10576100590905057. Archived from the original (PDF) on 2017-02-14 – via Taylor & Francis Inc.
^ Springer, Devin (2009-01-06). Islamic Radicalism and Global Jihad. Georgetown University Press. p. 29. ISBN 978-1589015784. Retrieved 3 December 2016. ^ Bassouni, Cherif (2013-10-21). The Shari'a and Islamic Criminal Justice in Time of War and Peace. Cambridge University Press. p. 200. ISBN 9781107471153. Retrieved 4 December 2016. ^ a b c d e f g h Al-Matroudi, Abdul Hakim Ibrahim (2015-02-14). "Ibn Taymīyah, Taqī al-Dīn". Oxford Islamic Studies Online. Oxford University Press. Retrieved February 14, 2015. ^ a b c d Esposito, John L. (2003). Unholy War: Terror in the Name of Islam. Oxford University Press. p. 45. ISBN 978-0-19-516886-0. ^ a b c d e f g h i j k Al-Matroudi, Abdul-Hakim (2015-02-14). "Ibn Taymīyah, Taqī al-Dīn Aḥmad". Oxford University Press. Retrieved February 14, 2015. ^ An-Na`im, Abdullahi Ahmed (2010). Islam and the Secular State: Negotiating the Future of Shari'a. Harvard University Press. p. 76. ISBN 978-0-674-03456-3. ^ a b c d e f g h i j k l m n o p q r s t u v w x y z aa ab ac ad ae af Michot, Yahya (2012). The Princeton Encyclopedia of Islamic Political Thought. Princeton University Press. pp. 238–241. ISBN 978-0-691-13484-0. ^ a b c d e f g h i j k l m Bearman, Peri (2007). The Law Applied: Contextualizing the Islamic Shari'a. I.B.Tauris. pp. 263–264. ISBN 978-1-84511-736-8. ^ a b c d e f g h Hillenbrand, Carole (1999). The Crusades: Islamic Perspectives. Edinburgh University Press. p. 242. ISBN 978-0-7486-0630-6. ^ a b Hastings, James (1908). Encyclopædia of Religion and Ethics. Volume;7. Morrison and Gibb Limited. p. 72. ^ Al-Dhahabi, Muhammad ibn Ahmad. Tadhkirat al-huffaz. Haidarabad. p. 48. ^ a b c d e f g h i j k l m n o p q r s t u v w x y z aa ab ac ad ae af ag ah ai aj ak al am an ao ap aq ar as at au av aw ax ay az ba bb bc bd be bf bg bh bi bj bk bl bm bn bo bp bq br bs bt bu bv bw bx Laoust, Henri (2012). ""Ibn Taymiyya." Encyclopaedia of Islam, Second Edition". BrillOnline. Retrieved 2015-01-28. ^ a b c d e f g Haque 1982, p. 6. ^ Ernst, Martin, Carl W., Richard C. (2012-11-27). Rethinking Islamic Studies: From Orientalism to Cosmopolitanism. ISBN 9781611172317. ^ a b c d e f g h i j k l Michel, Thomas (1985). "Ibn Taymiyya: Islamic Reformer". Studia missionalia. Volume 34. Rome, Italy: Pontificia Università Gregorian. ^ Al-Dimashqi al-Hanbali, Ibn `Abdul-Hadi. Al-'Uqud ad-Dariat. p. 3. ^ Al-Hanbali, Ibn al-`Imad (1932). Shadharat al-Dhahab. Cairo. pp. 385, 383, 404. ^ a b Haque 1982, pp. 38–44. ^ Ibn Taimiya, Taqi ad-Din (1996). Sharh Al-Aqeedat-il-Wasitiyah. Dar-us-Salam. p. 9. ^ a b c d e f g h Leaman, Oliver (2006). The Qur'an: An Encyclopedia. Taylor & Francis. pp. 280–282. ISBN 978-0-415-32639-1. ^ a b c Haque 1982, p. 8. ^ a b c d e f g h Nettler, Ronald L.; Kéchichian, Joseph A. (2015-02-14). ""Ibn Taymīyah, Taqī al-Dīn Aḥmad." The Oxford Encyclopedia of Islam and Politics". Oxford Islamic Studies Online. Oxford University Press. Retrieved February 14, 2015. ^ a b c d e f Bori, Caterina (2010). "Ibn Taymiyya wa-Jama`atuhu: Authority, Conflict and Consensus in Ibn Taymiyya's Circle". Ibn Taymiyya and His Times. Oxford University Press. ISBN 978-0-19-547834-1. ^ Schmidt-Leukel, Perry (2007). slam and Inter-Faith Relations: The Gerald Weisfeld Lectures 2006. SCM Press. p. 125. ISBN 978-0-334-04132-0. ^ a b c d e f g h i j k l m n o p q r s t Rapoport, Yossef; Ahmed, Shahab (2010). "Introduction". Ibn Taymiyya and His Times. Oxford University Press. ISBN 978-0-19-547834-1. ^ K. S. Lambton, Ann (2004). "The extinction of the caliphate: Ibn Jama'a and Ibn Taymiyya". State and Government in Medieval Islam: An Introduction to the Study of Islamic Political Theory. Routledge. p. 143. ISBN 978-0-19-713600-3. ^ Williams Clifford, Winslow (2013). State Formation and the Structure of Politics in Mamluk Syro-Egypt, 648-741 A.H./1250-1340 C.E. V&r Unipress. p. 163. ISBN 978-3-8471-0091-1. ^ a b c d Haque 1982, p. 9. ^ a b Watt, William Montgomery (2008). Islamic Philosophy and Theology. Transaction Publishers. p. 160. ISBN 978-0-202-36272-4. ^ a b Rougier, Bernard (2008). Everyday Jihad: The Rise of Militant Islam Among Palestinians in Lebanon. Harvard University Press. p. 162. ISBN 978-0-674-03066-4. ^ Lapidus, Ira M. (2012). Islamic Societies to the Nineteenth Century: A Global History. Cambridge University Press. p. 295. ISBN 978-0-521-73298-7. ^ a b c d Haque 1982, p. 10. ^ Lebanon Country Study Guide Volume 1 Strategic Information and Developments. Int'l Business Publications. 2012. p. 44. ISBN 978-0-7397-3913-6. ^ a b c d e f g h Hoover, Jon. "Taymiyyan Studies". Retrieved February 14, 2015. ^ a b c d e Aigle, Denise (2007). "The Mongol Invasions of Bilād al-Shām by Ghāzān Khān and Ibn Taymīyah's Three "Anti-Mongol" Fatwas" (PDF). Mamluk Studies Review. The University of Chicago: Page 105. Retrieved January 29, 2015. ^ Hawting, Gerald (2005). Muslims, Mongols and Crusaders. Routledge. p. 116. ISBN 978-0-7007-1393-6. ^ Kadri, Sadakat (2012). Heaven on Earth: A Journey Through Shari'a Law from the Deserts of Ancient Arabia ... macmillan. p. 187. ISBN 978-0-09-952327-7. ^ a b c d Haque 1982, p. 11. ^ Haque 1982, p. VII. ^ Jackson, Roy (2006). Fifty Key Figures in Islam. Routledge. p. 130. ISBN 978-0-415-35468-4. ^ Cooper, Barry (2005). New Political Religions, Or an Analysis of Modern Terrorism. University of Missouri Press. pp. 96–97. ISBN 978-0-8262-1621-2. ^ Ali, Kecia (2007). Islam: The Key Concepts. Routledge. p. 125. ISBN 978-0-415-39639-4. ^ Clarke, Lynda (2001). Rationalism in the School of Bahrain: A Historical Perspective, in Shīʻite Heritage: Essays on Classical and Modern Traditions. Global Academic Publishing. p. 336. ^ A. Saleh, Walid (2004). The Formation of the Classical Tafsīr Tradition. Brill Academic Pub. p. 220. ISBN 978-9004127777. ^ N. Keaney, Heather (2013). Medieval Islamic Historiography: Remembering Rebellion. Routledge. p. 108. ISBN 978-0-415-82852-9. ^ a b Saleh, Walid (2010). "Ibn Tayimiyah and the Rise of Radical Hermeneutics: An Analysis of "An Introduction to the Foundation of Quranic Exegesis". Ibn Taymiyya and His Times. Oxford University Press. ISBN 978-0-19-547834-1. ^ a b c d e f g Haque 1982, p. 12. ^ a b c d e f Winter, Michael (2004). The Mamluks in Egyptian and Syrian Politics and Society. BRILL. pp. 191–220. ISBN 978-9004132863. ^ Beranek, Ondrej; Tupek, Pavel (July 2009). Sohrabi, Naghmeh (ed.). From Visiting Graves to Their Destruction: The Question of Ziyara through the Eyes of Salafis (PDF). Crown Paper (Crown Center for Middle East Studies/Brandeis University). Brandeis University. Crown Center for Middle East Studies. p. 11. ^ Zargar, Cameron (2014). The Hanbal i and Wahhabi Schools of Thought As Observed Through the Case of Ziyārah. Ohio State University. pp. 33–34. Retrieved 19 May 2018. ^ a b c d e Haque 1982, p. 14. ^ George Makdisi, A Sufi of the Qadiriya Order, p 123. ^ Haque 1982, p. 15. ^ `Anhuri, Salim. Majallat al-Majma' al-'Ilmi al-'Arabi bi-Dimashq. 27. pp. 11, 193. ^ a b c d Kadri, Sadakat (2012). Heaven on Earth: A Journey Through Shari'a Law from the Deserts of Ancient Arabia …. macmillan. p. 135. ISBN 978-0-09-952327-7. ^ Kadri, Sadakat (2012). Heaven on Earth: A Journey Through Shari'a Law from the Deserts of Ancient Arabia ... macmillan. pp. 177–8. ISBN 978-0-09-952327-7. ^ a b c d e f g h i j k Ozervarli, M. Sait (2010). "The Qur'anic Rational Theology of Ibn Taymiyya and his Criticism of the Mutakallimun". Ibn Taymiyya and His Times. Oxford University Press. ISBN 978-0-19-547834-1. ^ a b c d Nettler, Ronald L. (2015-02-13). "Ibn Taymīyah, Taqī al-Dīn Aḥmad". Oxford Islamic Studies Online. Oxford University Press. Retrieved February 14, 2015. ^ Matroudi, Abdul Hakim (2006). The Hanbali School of Law and Ibn Taymiyyah: Conflict Or Conciliation. Routledge. p. 203. ISBN 978-0-415-58707-5. ^ Yossef Rapoport and Shahab Ahmed, Introduction in Ibn Taymiyya and His Times, eds. Yossef Rapoport and Shahab Ahmed (Karachi: Oxford University Press, 2010), 6. ^ Rapoport, Yossef; Ahmed, Shahab (2010-01-01). Ibn Taymiyya and His Times. Oxford University Press. p. 41. ISBN 9780195478341. ^ Rapoport, Yossef; Ahmed, Shahab (2010-01-01). Ibn Taymiyya and His Times. Oxford University Press. p. 269. ISBN 9780195478341. ^ a b Rapoport, Yossef; Ahmed, Shahab (2010-01-01). Ibn Taymiyya and His Times. Oxford University Press. p. 305. ISBN 9780195478341. ^ Rapoport, Yossef; Ahmed, Shahab (2010-01-01). Ibn Taymiyya and His Times. Oxford University Press. p. 270. ISBN 9780195478341. ^ Rapoport, Yossef; Ahmed, Shahab (2010-01-01). Ibn Taymiyya and His Times. Oxford University Press. p. 274. ISBN 9780195478341. ^ a b Rapoport, Yossef; Ahmed, Shahab (2010-01-01). Ibn Taymiyya and His Times. Oxford University Press. p. 271. ISBN 9780195478341. ^ Rapoport, Yossef; Ahmed, Shahab (2010-01-01). Ibn Taymiyya and His Times. Oxford University Press. p. 283. ISBN 9780195478341. ^ Rapoport, Yossef; Ahmed, Shahab (2010-01-01). Ibn Taymiyya and His Times. Oxford University Press. p. 191. ISBN 9780195478341. ^ Antony Black, The History of Islamic Political Thought (Edinburgh: Edinburgh University Press, 2001), 154. ^ a b Little, Donald P. "Did Ibn Taymiyya Have a Screw Loose?" Studia Islamica, no. 41, 1975, pp. 103-104. www.jstor.org/stable/1595400. ^ Krawietz, Birgit; Tamer, Georges (2013-08-29). Islamic Theology, Philosophy and Law: Debating Ibn Taymiyya and Ibn Qayyim al-Jawziyya. Walter de Gruyter. p. 258. ISBN 9783110285406. ^ Little, Donald P. "Did Ibn Taymiyya Have a Screw Loose?" Studia Islamica, no. 41, 1975, pp. 105. www.jstor.org/stable/1595400. ^ El-Rouayheb, Khaled (2015-07-08). Islamic Intellectual History in the Seventeenth Century. Cambridge University Press. p. 16. ISBN 9781107042964. ^ Khafif, Ibn (25 June 1999). "Correct Islamic Doctrine/Islamic Doctrine". ISCA – via Google Books. ^ "He has strongly influenced modern Islam for the last two centuries. He is the source of the Wahhābīyah, a reformist movement founded by Muḥammad ibn ʿAbd al-Wahhāb (died 1792), who took his ideas from Ibn Taymiyyah's writings. Ibn Taymiyyah also influenced various reform movements that have posed the problem of reformulating traditional ideologies by a return to sources. ^ Esposito, John L. "Ibn Taymiyah". Oxford Islamic Studies Online. Oxford University Press. Retrieved February 13, 2015. ^ Makdisis, Ussama (2010). Faith Misplaced: The Broken Promise of U.S.-Arab Relations: 1820–2001. PublicAffairs. p. 322. ISBN 978-1-58648-680-8. ^ Dekmejian, R. Hrair (1995). Islam in Revolution: Fundamentalism in the Arab World. Syracuse University Press. p. 40. ISBN 978-0-8156-2635-0. ^ "جدل فقهي بعد استعانة داعش بفتوى لابن تيمية لتبرير إحراق الكساسبة: ماذا كان موقف النبي وهل فعلها أبوبكر وعمر وعلي؟". ^ "القرضاوي: النصيريون أكفر من اليهود ولو كنت قادرا لقاتلت بالقصير". ^ Abdo, Geneive (7 June 2013). "Why Sunni-Shia conflict is worsening". CNN. Retrieved 12 September 2013. ^ ""moderate" commander boosting the morale of his troops by telling them that alawites are more infidels than christians and jews". Liveleak.com. Retrieved 19 August 2015. ^ a b c d e Haque 1982, p. 7. ^ Al-Kutubi, Shakir (1881). Fawat al-Wafayat. p. 35. ^ Krawietz, Birgit (2012). Islamic Theology, Philosophy and Law: Debating Ibn Taymiyya and Ibn Qayyim al-Jawziyya. de Gruyter. p. 195. ISBN 978-3-11-028534-5. ^ Hoover, Jon (2007). Ibn Taymiyya's Theodicy of Perpetual Optimism ([Online-Ausg.]. ed.). Leiden: Brill. pp. xii, 276. ISBN 9789004158474. ^ a b c Hoover, Jon (2016). "Withholding judgment on Islamic universalism: Ibn al-Wazir (d. 840/1436) on the duration and purpose of hell-fire. In: Locating Hell in Islamic traditions". Islamic History and Civilization. 119: 208–237. ^ Hoover, Jon (2016). "Withholding judgment on Islamic universalism: Ibn al-Wazir (d. 840/1436) on the duration and purpose of hell-fire. In: Locating Hell in Islamic traditions". Islamic History and Civilization. 119: 208. ^ Hoover, Jon (2016). "Withholding judgment on Islamic universalism: Ibn al-Wazir (d. 840/1436) on the duration and purpose of hell-fire. In: Locating Hell in Islamic traditions". Islamic History and Civilization. 119: 211. ^ a b c Kadri, Sadakat (2012). Heaven on Earth: A Journey Through Shari'a Law from the Deserts of Ancient Arabia …. macmillan. pp. 130–1. ISBN 978-0-09-952327-7. ^ a b c Haque 1982, pp. 66-67. ^ Haque 1982, pp. 66–67. ^ Haque 1982, p. 68. ^ Haque 1982, p. 67. ^ Ruth Mas (1998). "Qiyas: A Study in Islamic Logic" (PDF). Folia Orientalia. 34: 113–128. ISSN 0015-5675. ^ a b El-Omari, Racha (2010). "Ibn Taymiyya's Theology of the Sunna through His Polemics with the Ash'arites.". Ibn Taymiyya and His Times, Proceedings of a Conference Held at Princeton University. Oxford University Press. ISBN 978-0-19-547834-1. ^ a b Opwis, Felicitas Meta Maria (2010). Maṣlaḥah and the Purpose of the Law: Islamic Discourse on Legal Change from the 4th/10th to 8th/14th Century. Brill. p. 189. ISBN 9789004184169. ^ a b c Haque 1982, p. 20. ^ a b Haque 1982, p. 21. ^ Haque 1982, pp. 20–21. ^ Haque 1982, pp. 21–24. ^ G. F. Haddad (1996-03-20). "IBN TAYMIYYA ON FUTOOH AL-GHAYB AND SUFISM". Retrieved 2011-03-24. ^ Alshamsi, Mansoor Jassem (2011). Islam and Political Reform in Saudi Arabia: The Quest for Political Change. Routledge. p. 54. ISBN 9781134126538. Retrieved 19 September 2015. ^ a b c Kadri, Sadakat (2012). Heaven on Earth: A Journey Through Shari'a Law from the Deserts of Ancient Arabia ... macmillan. p. 139. ISBN 978-0-09-952327-7. ^ Kadri, Sadakat (2012). Heaven on Earth: A Journey Through Shari'a Law from the Deserts of Ancient Arabia ... macmillan. pp. 139–40. ISBN 978-0-09-952327-7. ^ a b c Hassan, Mona (2010). "Modern Interpretations and Misinterpretations of a Medieval Scholar: Apprehending the Political Thought of Ibn Taymiyyah.". Ibn Taymiyyah and His Times. Oxford University Press. ISBN 978-0-19-547834-1. ^ a b DeLong-Bas, Natana J. (2004). Wahhabi Islam: From Revival and Reform to Global Jihad (First ed.). New York: Oxford University Press, USA. pp. 252–3. ISBN 978-0-19-516991-1. ^ Peters, Rudolph (1996). Jihad in Classical and Modern Islam: A Reader. Princeton: Marcus Wiener. p. 48. ^ Bin Bayyah, The Concept of Jihad. ^ Peters, Rudolph (1996). Jihad in Classical and Modern Islam: A Reader. Princeton: Marcus Wiener. p. 52. ^ Esposito, John L. (2015-02-14). "Ibn Taymiyyah, Taqi al-Din Ahmad". Oxford Islamic Studies Online. Oxford University Press. Retrieved February 14, 2015. ^ Hallaq, Wael B. (October 2011). Ibn Taymiyya Against the Greek Logicians. doi:10.1093/acprof:oso/9780198240433.001.0001. ISBN 9780198240433. ^ Spevack, Aaron (2014). The Archetypal Sunni Scholar: Law, Theology, and Mysticism in the Synthesis of Al-Bajuri. State University of New York Press. pp. 143/145. ISBN 978-1-4384-5370-5. ^ Spevack, Aaron (2014). The Archetypal Sunni Scholar: Law, Theology, and Mysticism in the Synthesis of Al-Bajuri. State University of New York Press. p. 143. ISBN 978-1-4384-5370-5. ^ Ibn Taymiyyah, Taqi al-Din (1905). Majmu'at al-Rasail al-Kubra. 2. Cairo. pp. 53–63. ^ Ibn Taymiyyah, Taqi al-Din (1903). Minhaj al-Sunna al-Nabawiya. 1. Bulaq. p. 132. ^ Ibn Taymiyyah, Taqi al-Din (1908). Majmu'at Fatawa. 2. Cairo. p. 185. ^ a b Haque 1982, p. 84. ^ John Renard, Friends of God: Islamic Images of Piety, Commitment, and Servanthood (Berkeley: University of California Press, 2008); Idem., Tales of God Friends: Islamic Hagiography in Translation (Berkeley: University of California Press, 2009, et passim). ^ See Ibn Taymiyyah, Majmu'a Fatawa Ibn Taymiyya (Cairo: Dar ar-Rahmat, u.d. ), Vol. 10, p. 516; for the traditional narratives of these saints, see: John Renard, Friends of God: Islamic Images of Piety, Commitment, and Servanthood (Berkeley: University of California Press, 2008). ^ Haque 1982, p. 83. ^ a b c d Haque 1982, pp. 78–81. ^ a b c d e Rapoport, Yossef; Ahmed, Shahab (2010-01-01). Ibn Taymiyya and His Times. Oxford University Press. p. 291. ISBN 978-0-19-547834-1. ^ a b Rapoport, Yossef; Ahmed, Shahab (2010-01-01). Ibn Taymiyya and His Times. Oxford University Press. p. 292. ISBN 978-0-19-547834-1. ^ Rapoport, Yossef; Ahmed, Shahab (2010-01-01). Ibn Taymiyya and His Times. Oxford University Press. pp. 294–295. ISBN 9780195478341. ^ Rapoport, Yossef; Ahmed, Shahab (2010-01-01). Ibn Taymiyya and His Times. Oxford University Press. p. 294. ISBN 9780195478341. ^ a b c Spevack, Aaron (2014). The Archetypal Sunni Scholar: Law, Theology, and Mysticism in the Synthesis of Al-Bajuri. State University of New York Press. p. 92. ISBN 978-1438453712. ^ a b c Reynolds 2012, p. 174. ^ Memon, Muhammad Umar, ed. (1976). Ibn Taimiya's Struggle Against Popular Religion: With an Annotated Translation of His Kitab iqtida as-sirat al-mustaqim mukhalafat ashab al-jahim (reprint ed.). Walter de Gruyter. p. 361. ISBN 9783111662381. ^ a b al-Jamil, Tariq (2010). "Ibn Taymiyya and Ibn al-Mutahhar al-Hilli: Shi`a Polemics and the Struggle for Religious Authority in Medieval Islam". Ibn Taymiyyah and His Times. Oxford University Press. ISBN 978-0-19-547834-1. ^ Marion Holmes Katz (2007). The Birth of The Prophet Muhammad: Devotional Piety in Sunni Islam. Routledge. p. 116. ISBN 978-1-135-98394-9. ^ Hosseini, Hamid S. (2003). "Contributions of Medieval Muslim Scholars to the History of Economics and their Impact: A Refutation of the Schumpeterian Great Gap". In Biddle, Jeff E.; Davis, Jon B.; Samuels, Warren J. (eds.). A Companion to the History of Economic Thought. Malden, MA: Blackwell. pp. 28–45. doi:10.1002/9780470999059.ch3. ISBN 978-0-631-22573-7. ^ Baeck, Louis (1994). The Mediterranean tradition in economic thought. Routledge. p. 99. ISBN 978-0-415-09301-9. ^ Cizakca, Murat (2013). Islamic Capitalism and Finance: Origins, Evolution and the Future. Edward Elgar Pub. p. xxii. ISBN 978-0857937629. ^ a b c d e "PERPETUAL CREATIVITY IN THE PERFECTION OF GOD: IBN TAYMIYYA'S HADITH COMMENTARY ON GOD'S CREATION OF THIS WORLD" (PDF). Retrieved 2016-07-20. ^ "DigiTool - Results - Full". Retrieved 2016-07-20. ^ Chopra, Ramesh (2005). Encyclopedic Dictionary of Religion (A-F). 1. Isha Books. pp. 211–212. ISBN 978-8182052857. ^ a b c al-Turayri, Shaykh Abd al-Wahhab. "The Mardin Conference – Understanding Ibn Taymiyyah's Fatwa". MuslimMatters. Retrieved 29 May 2011. ^ a b c d e f Bassiouni, M. Cherif (2013). The Shari'a and Islamic Criminal Justice in Time of War and Peace. Cambridge University Press. p. 200. ISBN 978-1-107-68417-1. ^ Benjamin, Daniel; Simon, Steven (2003). The Age of Sacred Terror: Radical Islam's War Against America. Random House Trade. pp. VI. ISBN 978-0-8129-6984-9. ^ a b Farr, Thomas F. (2008). World of Faith and Freedom: Why International Religious Liberty Is Vital to American National Security. Oxford University Press. p. 227. ISBN 978-0-19-517995-8. ^ Freeden, Michael (2013). The Oxford Handbook of Political Ideologies. Oxford University Press. p. 633. ISBN 978-0-19-958597-7. ^ Aaron, David (2008). In Their Own Words. RAND Corporation. p. 46. ISBN 978-0-8330-4402-0. ^ "A religious basis for violence misreads original principles". The National. Retrieved 2012-10-04. ^ Ibn Taymiyyah, Epistle on Worship: Risalat al-'Ubudiyya, tr. James Pavlin (London: Islamic Text Society, 2015), intro. ^ "Ibn Taimiyah". Usc.edu. Retrieved 2010-06-09. ^ "Ibn Taymiyya's Critique of Shī'ī Imāmology. Translation of Three Sections of his "Minhāj al-Sunna", by Yahya Michot, The Muslim World, 104/1–2 (2014), pp. 109–149. ^ Jaffer, Tariq (2014-11-28). Razi: Master of Quranic Interpretation and Theological Reasoning. Oxford University Press. p. 118. ISBN 978-0-19-994799-7. ^ a b Haque 1982, p. 16. Dar, Irfan Jameel - "The life and thought of Ibn Taymiyyah, the reviver of Historical Salafi Thought" https://www.academia.edu/19877780/The_thought_of_Ibn_Taymiyyah. Kepel, Gilles – Muslim Extremism in Egypt: The Prophet and pharaoh. With a new preface for 2003. Translated from French by Jon Rothschild. Berkeley & Los Angeles: University of California Press, 2003. See pp. 194–199. Little, Donald P. – "Did Ibn Taymiyya have a screw loose? ", Studia Islamica, 1975, Number 41, pp. 93–111. Sivan, Emmanuel – Radical Islam: Medieval Theology and Modern Politics. Enlarged edition. New Haven & London: Yale University Press, 1990. See pp. 94–107. Michot, Yahya – Ibn Taymiyya: Against Extremisms. Texts translated, annotated and introduced. With a foreword by Bruce B. LAWRENCE. Beirut & Paris: Albouraq, 2012, xxxii & 334 p. — EAN 9782841615551. Michot, Yahya – Ibn Taymiyya: Muslims under Non-Muslim Rule. Texts translated, annotated and presented in relation to six modern readings of the Mardin fatwa. Foreword by James Piscatori. Oxford & London: Interface Publications, 2006. ISBN 0-9554545-2-2. Michot, Yahya – "Ibn Taymiyya's 'New Mardin Fatwa'. Is genetically modified Islam (GMI) carcinogenic?" in The Muslim World, 101/2, April 2011, pp. 130–181. Michot, Yahya – "From al-Ma'mūn to Ibn Sab'īn, via Avicenna: Ibn Taymiyya's Historiography of Falsafa," in F. OPWIS & D. REISMAN (eds. ), Islamic Philosophy, Science, Culture, and Religion. Studies in Honor of Dimitri Gutas (Leiden – Boston: Brill, 2012), pp. 453–475. Michot, Yahya – "Between Entertainment and Religion: Ibn Taymiyya's Views on Superstition," in The Muslim World, 99/1, January 2009, pp. 1–20. Michot, Yahya – "Misled and Misleading… Yet Central in their Influence: Ibn Taymiyya's Views on the Ikhwān al-Safā'," in The Ikhwān al-Safā' and their Rasā'il. An Introduction. Edited by Nader EL-BIZRI. Foreword by Farhad DAFTARY (Oxford: Oxford University Press, in association with the Institute of Ismaili Studies, Epistles of the Brethren of Purity), 2008, pp. 139–179. Michot, Yahya – "Ibn Taymiyya's Commentary on the Creed of al-Hallâj," in A. SHIHADEH (ed. ), Sufism and Theology (Edinburgh, Edinburgh University Press, 2007), pp. 123–136. Michot, Yahya – "A Mamlûk Theologian's Commentary on Avicenna's Risāla Aḍḥawiyya. Being a Translation of a Part of the Dar' al-Ta'āruḍ of Ibn Taymiyya, with Introduction, Annotation, and Appendices, Part I," in Journal of Islamic Studies, 14:2, Oxford, 2003, pp. 149–203. Michot, Yahya – "A Mamlûk Theologian's Commentary on Avicenna's Risāla Aḍḥawiyya. Being a Translation of a Part of the Dar' al-Ta'āruḍ of Ibn Taymiyya, with Introduction, Annotation, and Appendices, Part II," in Journal of Islamic Studies, 14:3, Oxford, 2003, pp. 309–363. Michot, Yahya – "Ibn Taymiyya on Astrology. Annotated Translation of Three Fatwas," in Journal of Islamic Studies, 11/2, Oxford, May 2000, pp. 147–208. Michot, Yahya – "Ibn Taymiyya's Critique of Shī'ī Imāmology. Translation of Three Sections of his Minhāj al-Sunna," in The Muslim World, 104/1–2, Hartford, Jan–April 2014, pp. 109–149. Michot, Yahya – "An Important Reader of al-Ghazālī: Ibn Taymiyya," in The Muslim World, 103/1, Hartford, January 2013, pp. 131–160.